FOUR! I mean FIVE! I mean FIRE! 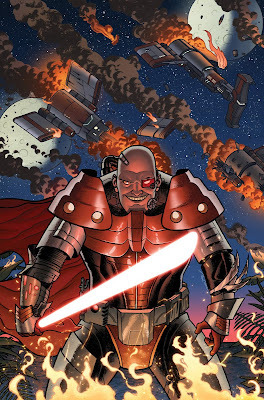 The solicits came out today (on my birthday, no less) for the next issue in my run of Star Wars covers for Dark Horse. Pictured here is the 'big bad' of the story - feared sith lord and contender for the Mr. Clean look-alike contest, Lord Odion. Happy Birthday Joe! These Star Wars covers are turning out great. It looks like you are having a lot of fun with them dude. Keep it up!